The NFL’s developmental circuit, the World League of American Football, took the field in the spring of 1991. 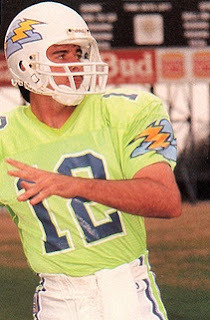 The first week’s games, which for the most part were rather conservatively played and low-scoring, concluded with a Monday night contest between the Orlando Thunder and San Antonio Riders on March 25, 1991. The Thunder were coached by Don Matthews, who had previously been with several CFL clubs, and utilized a no-huddle offense. QB Kerwin Bell (pictured at right) was a local product out of the Univ. of Florida and was the Southeastern Conference’s all-time leader in passing yards and TD passes. While he had been with three NFL teams, Bell had never thrown a regular season pass for any of them, and he was coming off of a major knee injury the previous year. San Antonio, under Head Coach Mike Riley, had the sibling combination of QB Jason Garrett (future head coach of the Dallas Cowboys) and WR John Garrett (future assistant coach with many pro and college teams) on a roster that, like the league’s other clubs, primarily contained players that were young and unknown, seeking to catch the attention of NFL teams. There were 21,714 enthusiastic fans in attendance on a Monday night at the Florida Citrus Bowl. On the first play from scrimmage, Bell connected with RB Eric Mitchell on a crossing pattern for a 75-yard touchdown. Charlie Baumann added the extra point for the quick 7-0 Orlando advantage. The Riders responded with a possession that advanced 74 yards in nine plays. Jason Garrett threw to RB Ricky Blake for a 24-yard gain along the way and the series concluded with Blake running for an eight-yard TD. Teddy Garcia tied the score with the point after. The Thunder advanced to another score, with Bell this time connecting with WR Byron Williams, a veteran of the CFL, for a 42-yard touchdown. Baumann again successfully converted to make the score 14-7 with 4:49 remaining in the opening period. To start the second quarter, Bell again threw to Williams for a 37-yard TD, but the try for the point after was blocked. Still, Orlando took a 20-7 lead into halftime. Bell had completed only 7 of 19 passes, but they were good for 197 yards and three touchdowns. San Antonio had the momentum in the third quarter. Garrett passed to Blake from a yard out for one touchdown and RB Undra Johnson ran three yards for another. Garcia successfully converted after each to put the visitors in front by 21-20. Later in the period, the Thunder rebounded to re-take the lead. Bell threw to Williams once again for a 23-yard TD. Another Bell pass, to TE Bruce LaSane, was complete for a two-point conversion. In the fourth quarter, Bell connected with WR Chris Roscoe for a one-yard touchdown, his fifth of the game, and Baumann booted the extra point. Down 35-21, San Antonio narrowed the gap as backup QB Lee Saltz threw to John Garrett for a 25-yard touchdown. The Riders scored again when Johnson ran for a five-yard TD with 1:24 remaining to play in regulation. Rather than attempt a two-point conversion for the potential win, Coach Riley chose to play for the tie, but Garcia hooked the extra point attempt to the left and Orlando held on to win by a final score of 35-34. San Antonio had the edge in total yards (377 to 365), first downs (24 to 18), and time of possession (32:52 to 27:08). The Thunder had six sacks, to two by the Riders, who were also penalized 10 times to four flags thrown on Orlando. Each team turned the ball over once. Kerwin Bell completed 14 of 34 passes, good for 269 yards and five touchdowns with one interception. Byron Williams had four catches for 113 yards and three TDs and Eric Mitchell, with the one long score to start the game, gained 95 yards on his three receptions. RB Myron Jones led Orlando’s rushers with 85 yards on 15 carries. For the Riders, Jason Garrett was successful on 16 of 25 throws for 121 yards and a TD with none picked off and Lee Saltz was 9-of-15 for 127 yards with a touchdown and no interceptions. WR Dwight Pickens caught 8 passes for 52 yards and John Garrett gained 95 yards on his three receptions. Undra Johnson ran for 79 yards on 15 rushing attempts that included two TDs and Ricky Blake gained 73 yards on 8 carries that also included a touchdown. Orlando won big the next week but then lost five straight games. While the Thunder rebounded with three wins to finish out the regular season, they ended up with a 5-5 record and finished second in the North American East Division. The Riders placed second in the North American West Division at 4-6. Kerwin Bell went on to complete 181 of 325 passes for 2214 yards and tied for the league lead with 17 touchdown passes while giving up 14 interceptions. He ranked fourth in passing with a 76.4 rating. He was back with the Thunder in 1992, but as a little-used backup to Scott Mitchell. While he finally saw some brief regular season action for the Colts in 1995, his most significant playing time came during eight CFL seasons, most notably with Toronto in 1998 when he threw for 4991 yards and 27 TDs.